In which Dr. Jerome Corsi rides the equine skeleton for all it's worth, Trump is/not convinced by the Long Form, World Net Daily continues its barrage of stupid, and LTC Lakin ponders his next moves. It's been one month after the big reveal, and while, as some predicted, the unveiling of the Long Form Birth Certificate may have encouraged an exodus from Birtherstan, it has not silenced its loudest voices. Nor has it made them any less pathetic -- scrabbling like arthropods from one played-out piece of lost candy to another in search of some deeper, greater truth they can hold onto. 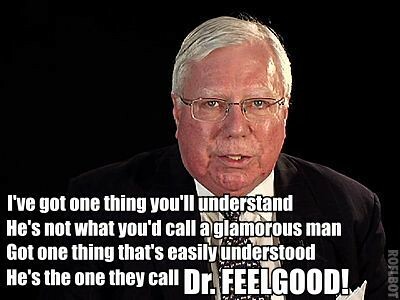 The top ant this week is the one and only Jerome "Dr. Feelgood" Corsi, who's most recent work, "Where's the Birth Certificate," is tipped to go on both the New York Times and Publishers Weekly bestsellers, according to World Net Daily. Not trusting them any further than we could comfortably spit a dead horse, we were able to confirm the NYT, at least, where it will be debuting at #6 on June 5th. We were also able to confirm that a decent percentage of the sales is due to bulk sales, which means that the numbers could have been artificially inflated. The real test will be to see how long the book actually remains in the top ten on either list. I'm betting two weeks at most, verging downwards. However, the book may receive a boost due to the author's increasing notoriety. While Corsi had a hard time making it -- or at least getting a fair shake -- on the big talk circuit, he managed to get on a number of radio shows. In this interview, he let it be known that he wasn't going to let Joseph "Mr. Mustache" Farah have all the lawsuit fun, and was going to be raising a legal challenge against President Obama for criminal fraud. Interviewer: At some point Dr. Jerome Corsi... how do these things, we have about a minute remaining, minute and a half. How does this ever come to a head? How does this ever have a resolution? Corsi: I think we'll be calling... I'm working on filing criminal charges on the White House for, uh, I think there will be criminal charges filed pretty soon, for having fraudulently produced a birth certificate, asking for an FBI investigation. It's at 16:15 into the interview if you don't feel like listening to a lot of birther boilerplate. I can hardly wait to see how it turns out. Can the FBI deport American citizens? Meanwhile, over at World Net Daily, there's a war of words ongoing between themselves and their former great white hope, Donald Trump. It seems that Donald isn't sure whether he believes the Long Form Birth Certificate is legitimate or not, and WND is stuck in the middle. Needless to say, they don't like it. "I have strongly begun to suspect that Trump had other motives than seeking the truth about Obama. I think he was pumping Corsi for information for some other purpose than being on the right side of history." Like they needed any help in that matter? We should also consider that, this same week, World Net Daily produced two unintentionally amusing stories. First, just to prove you can't kill some monsters, is the Son of the Eligibility Billboard, coming soon to a neighborhood full of well-moneyed and/or highly gullible people near you. The second is a lengthy piece that asks if there are hidden messages in the Long Form Birth Certificate, including a smiley face in a signature and the words "VOID" floating somewhere in the computer junk. But before you laugh too loudly, our friends at Obama Conspiracy Theories have looked into the matter, and can confirm that there may be more to this mystery than the usual rightwingnut buffoonery we've come to expect from WND. Proceed with an open mind! In something of old news, we've caught up with LTC Lakin, courtesy of caaflog, by way of Badfiction. Now that he's had his steak and fritos, he's made some decisions as to what to do next. Right now, I’m on appellate leave, which means I’m still on active duty but not receiving pay and just no, no duties other than preparing for possible appeals. And the appellate process can take up to, you know, 6 months to 18 months. The other option would be to waive the appeal process and receive my DD 214, or discharge papers, and I would be separated immediately from the military and go on with my life with no other ties with the military. When I get back to the family tomorrow, I want to spend some missed time with them and, you know, after, after a little while I do need to — or in the next few weeks, I need to look into reestablishing my medical license and, and seeking employment. I need to find a way to provide for my family and then I want to continue with some type of service to our country or to some faith-based organization or do what I can to still enjoy helping others. Certainly, certainly that’s a driving desire in myself. How about helping us to better understand the forces that talked you into disobeying orders and disgracing your otherwise-impeccable military record? How exactly did you get shopped into being a sucker for that dogbite attorney? There's a bigger story here than your own downfall, sir. Please tell us. Finally, that noted Reptile Devil Woman Orly Taitz needs your money so she can subpoena people. Please buy one of her new, eye-catching and snazzy bumperstickers so she can defend America from uppity usurpers who won't let her feeeeeeee-neesh!!! !